Of all of the animated Disney classics, 1967's The Jungle Book is probably the least likely to work as a successful live action adaptation. Talking animals work just fine in animation - no one bats an eye when the fish converse in Finding Nemo, after all - but bringing these anthropomorphic beings into a live action film could be a cause for concern. Talking animals are ridiculous, there's no two ways about it, but this is why cartoons get away with it: we don't expect realism, so when a fish starts talking about its dodgy memory capacities we just deem it acceptable. So what happens, then, when a film maker decides to bring these talking animals into a film that strives to be as realistic as possible? Well, it's jarring, and for that reason alone the first fifteen or so minutes of Jon Favreau's The Jungle Book struggle to kick things off in an exciting manner. But when you have a film so visually beautiful and injected with this much heart, humour and nostalgia, once those doubts drift away they show no signs of returning. The Jungle Book smartly keeps its premise near enough identical to the original. Mowgli (Neel Sethi) is a "man cub" raised by wolves in the jungle after he was brought to them as a baby. However, the tiger Shere Khan (Idris Elba) has a personal and passionate hatred for humans, which leads him to threaten Mowgli's life. Mowgli decides it is safer for all of the jungle's animals if he leaves and he begins his journey back to the man village on the jungle's outskirts. Keeping things simple and straightforward in the film's first act is a clever idea, as this whole photo-realistic-animals-that-talk thing does take a while to grow accustomed to. It's a testament to the CGI, really, that this does look and feel so strange. We're presented with animals that look one hundred percent real, that is until their mouths open and contort with English dialogue. It's unnatural and initially very uneasy on the eye, but The Jungle Book plows through its opening act quickly enough that the story doesn't grow tiresome. Perhaps some character and thematic framework are lost along the way, but it's a sacrifice that needed to be made in order for the rest of the film to have any hope of working. That the rest of the film does in fact work is impressive, but that it all works as fantastically well as it does is quite simply miraculous. 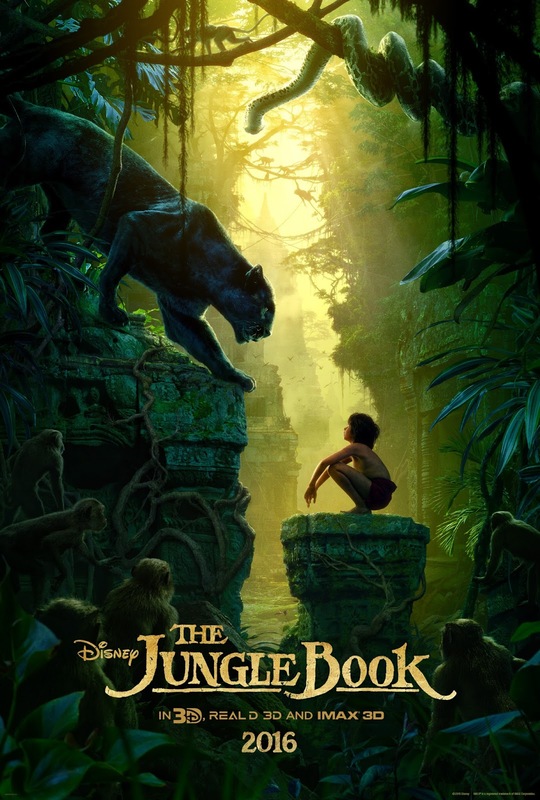 Despite the shaky first act, once Mowgli is ambushed by the snake Kaa (the all too brief Scarlett Johansson) and rescued by the bear Baloo (the terrific Bill Murray), the film soars. It's benefited an enormous deal by the talented array of actors providing the film's voices. Murray is great fun as Baloo, bringing to a life a character embodied by fun but rooted in something much more personal. Ben Kingsley is captivating and powerful as the panther Bagheera, and other names like Lupita Nyong'o, Giancarlo Esposito and Christopher Walken make the most of their moments in the spotlight. The only real outlier is Idris Elba who, whilst still generally solid for the most part, struggles to deliver Khan's anger and rage in the impressively intense final act. For this final act to work emotionally we need to believe the motives on both sides of the line, and Elba just doesn't quite strike the right tone in these vital moments. Any quells with Elba's performance, though, are diminished by the sensational turn that newcomer Neel Sethi gives as Mowgli. In what is turning out to be a fantastic year for young actors (Jacob Tremblay captured the heart of the world in Room just a few months ago), Sethi is an always engaging on-screen presence, fully capturing the heart and spirit that Mowgli as a character should represent. All at once he manages to portray devastation, determination, betrayal and anger, yet he keeps the audience rooting for him. As well as the more deeply invested layers in his character, Sethi also excels in simply making Mowgli likable - the film's musical numbers shouldn't really work, but Sethi is clearly having a blast filming them, and that fun comes across on screen by the bucket load. It's unlikely to gain any traction come award season due to his young age, but it's a superlative performance nonetheless. That it's the only live action performance in the film - a film whom's world is rendered entirely by CGI, at that - just makes him all the more credible. And speaking of the CGI, it's all just as breathtaking to behold as you'd hope. When none of the animals are talking or when the film cuts back away from the characters to focus on the scenery, it would be easy to mistake what you're seeing for a real location. The film begins with Disney's trademark castle ident, then the camera pulls backwards into the jungle, and the world feels real already. Special effects are used so frequently in film nowadays that it's relatively easy to criticise their use, but it's films like this that go to prove how much spectacle and wonder that CGI can bring when applied correctly. Think Avatar, think Gravity. The Jungle Book may not quite be to the same standard as Gravity as a film in general (I'd place it a good few notches above Avatar, though), but its application of special effects holds up against it. There are the odd few moments here and there - like I've said, the talking animals take some getting used to, and King Louie is a bizarre sight to behold - but it's mostly breathtaking stuff. In fact, that's a rather apt way to sum up The Jungle Book on the whole, really. There are a few moments where the tension slips or voice acting stumbles, but for the most part it's an absolute delight. Director Jon Favreau and screenwriter Justin Marks have taken a classic film and re-imagined it in a modern and stylish way without sacrificing its heart and soul. This may not be quite as magical as the original, but what it lacks in magic and excitement it more than makes up for in nostalgia and visual beauty. This film just shouldn't work, and I'm still rather in shock that it did, but these are the best kinds of films - the ones that prove there's so much more life in mainstream cinema than people give it credit for. People cry out for more original ideas, and of course that would be wonderful, but when remakes as great as this one can come along and hold their ground against these so desperately fought for original features, I find little to complain about. Here we have a film that had each and every odd stacked against it that has come out and delivered in spades. So you know what, people? Forget about your worries. Forget about your strife. The Jungle Book has all the bare necessities it needs. What a treat this is. To Summarise: Visually breathtaking, packed with heart and rounded off with an array of superb vocal performances, The Jungle Book is a deeply enjoyable and suitably nostalgic adventure that finds a revelational lead in newcomer Neel Sethi.